We’re calling this a Quilled Duck, but it might also be a chick. You can call it whatever you want. 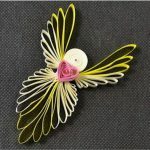 It is a simple beginning quilling project to teach the kids. Quilling is a fascinating art form that makes the loveliest projects. Our contributor used this duck to decorate an Easter egg, but it would also make a beautiful card or package decoration. Trivia: Quilling also known as paper filigree is an art form that involves the use of strips of paper that are rolled, shaped, and glued together to create decorative designs. The paper is rolled, looped, curled, twisted and shaped to make up designs. 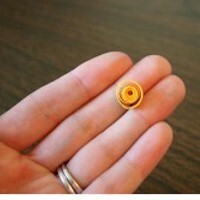 To make the Quilled Duck you must begin by understanding the basics of quilling. 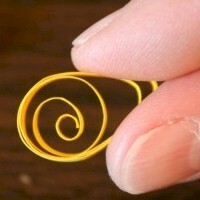 All paper quilling starts with rolling the strips of paper into a spiral. I like to do this by wrapping it around a toothpick. 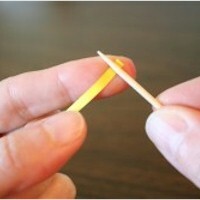 Just put the paper against your finger and lay the toothpick on top, then use your finger and thumb to curl the the end of the paper tightly around the toothpick. Keep on going until the whole paper is wrapped, then just slide it off the toothpick. The length of paper you’ll use will depend on how big of a circle you want. For my Easter designs, I used 8″ of paper for the larger coils and 4″ for the smaller ones. If the center pulls out of your coil while you’re pulling it off the toothpick, just use your thumb and finger to press the coil down flat again. Then just let go of the coil and let it relax. It will unwind slightly, which is exactly what you want it to do. If you’re aiming for an exact size, you may need to tighten or loosen the coil a little to get it just right. Then use a toothpick to apply a little dot of ordinary white glue to the end of the paper. Use your finger to hold it in place for a few seconds until it dries. For the duck, you’ll need two circles, one larger than the other. Since my paper was only 8″ long, I had to uncoil the larger one quite a bit to get it to be big enough. If I had used longer paper, it would’ve been a bit easier, but I rather like the open look I ended up with. 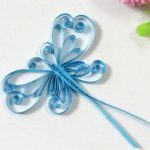 One of the most popular techniques with quilling that will let you create tons of different effects is a simple pinch. To do it, just put your fingers on each side of the coil and bring them together, pinching the edge into a point. Pretty easy, right? You just made the duck’s body! Use a dab of glue to attach the smaller coil to the larger, pinched one. This duck is really coming together now. All he needs now is a beak, and that’s easy enough to do with a tiny piece of orange quilling paper. Just fold it into a V shape and glue it to the duck’s head. So cute!